Keep Baldy Wild has adopted! Mt. 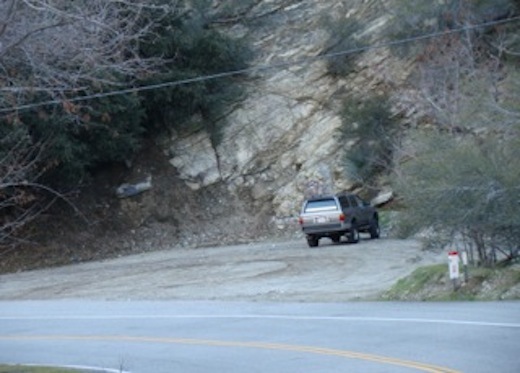 Baldy Road from the Padua Avenue signal to the Mt Baldy ski lift parking lot is 11 miles. The route is a lovely drive used not only by mountain residents, but by hikers, bicyclists, motorcyclists, winter snow enthusiasts, campers, picnickers and more. Tracy Sulkin noticed that the turnouts alongside the route were becoming littered, spoiling the beauty of the mountain area. She decided to do something about the collecting debris. She mapped and numbered all the turnouts and invited residents and visitors to the mountain to “adopt a turnout”–commit to the clearing and ongoing cleaning of their chosen turnout. At the 2012 Big Horn Music Festival she set up a booth to share her project and gather support for it. In less than a year enough volunteers have signed up to care for 1/3 of the turnouts. If you are interested in adoption (turnouts only of course), please contact Tracy Sulkin (baldyhut@verizon.net) to learn more about the Adopt a Turnout Program. Thanks Tracy! Click below to read the Claremont Courier article highlighting Tracy’s efforts!